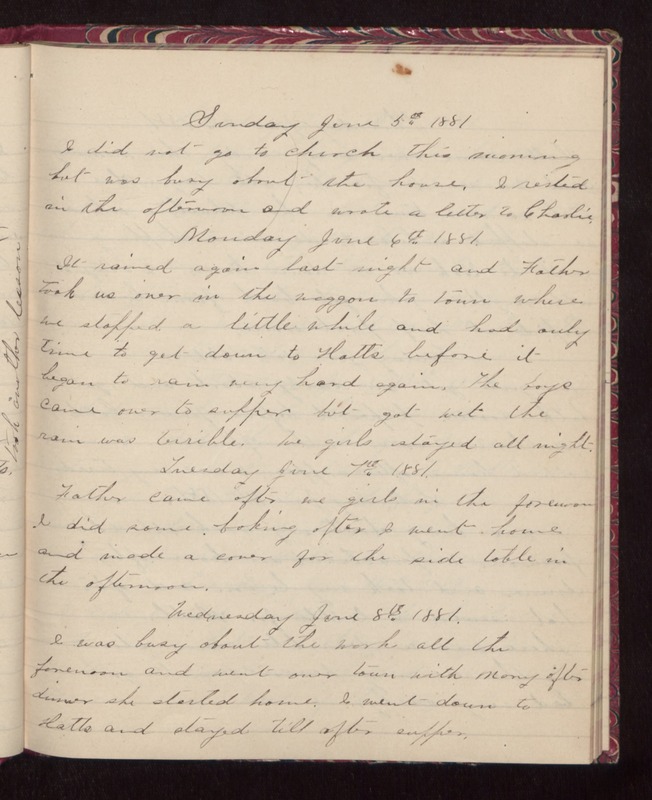 Sunday June 5th 1881 I did not go to church this morning but was busy about the house. I rested in the afternoon and wrote a letter to Charlie. Monday June 6th 1881. It rained again last night and Father took us over in the waggon to town where we stopped a little while and had only time to get down to Hatts before it began to rain very hard again. The boys came over to supper but got wet the rain was terrible. We girls stayed all night. Tuesday June 7th 1881. Father came after we girls in the forenoon I did some baking after I went home and made a cover for the side table in the afternoon. Wednesday June 8th 1881. I was busy about the work all the forenoon and went over town with Mary after dinner she started home. I went down to Hatts and stayed till after supper.